Pat Murphy, the interim manager of the San Diego Padres, took Matt Kemp and Justin Upton out of a game last night just to screw with reporters. #Padres int manager Pat Murphy said he pulled Upton and Kemp late to get them off their feet "and give you guys something to think about." It was a rare moment of cheekiness, a finger in the eye of Hug Watch, and it wasn’t the craziest instance of trade deadline-related shenanigans in the Mets-Padres game, let alone the entire league. The Dodgers and Marlins made a fairly substantial trade on Wednesday that may or may not be done, and may or may not currently involve the Braves. Troy Tulowitzki made his Blue Jays debut and blasted out of his Denver-to-Canada move like Patrick Roy in reverse, going 3-for-5 with two doubles and a home run. All of that would’ve made the A-block on Baseball Tonight in a normal night, and all of it wound up below the fold, like the ceasefire that ended the 100 Hour War between Honduras and El Salvador on July 20, 1969. We hear that phrase a lot and tune it out, because players rarely fail physicals. Word eventually got down to Flores that he and Zack Wheeler had been traded to Milwaukee. This was textbook Hug Watch, with a player finding out he’s on the move midgame. Except Flores didn’t come out of the game. He stayed out at shortstop until the ninth inning, looking like he was reliving the last 20 minutes of Toy Story 3 in his mind. So when Mets GM Sandy Alderson came out and said that there was no trade, and would never be one, Baseball Twitter reacted appropriately to a warning — “pending physicals” — that it had ignored routinely for years finally becoming relevant. It reacted the way you’d react if you found yourself in the exit row and your plane started going down. Ken Rosenthal reported late Wednesday that the Mets backed out of the deal because of concerns over Gomez’s hip — a charge that Gomez’s agent, Scott Boras, vehemently denied — scuttling the trade and robbing the Mets not only of a very good two-way center fielder, but of the fleeting, irrational emotional salve of Gomez coming back after having been traded for Johan Santana in 2008 and then blossoming into an All-Star elsewhere. And Flores cried on the field for nothing. Flores thought he was leaving the franchise he’d been with a third of his life, since he was 16 years old, and was put back in the field to ponder that silently, with half a dozen TV cameras trained on his face. You’d cry, too. It was the perfect #LOLMets moment, the capstone of a season in which flashes of extreme on-field competence are dissolved, like salt in water, into an organizational spectacle too literally pitiful to laugh at. And that wasn’t the biggest news of the night, either. Because after a year of being pilloried by the national media for its intransigence, the politburo that runs the Phillies finally traded Cole Hamels. 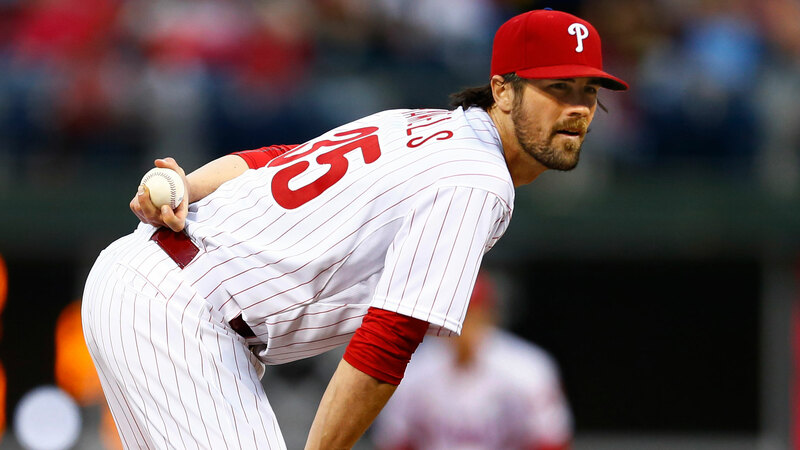 Since the Phillies turned from powerhouse to laughingstock, Hamels’s name has been floated in trade rumors, and there has been no more persistent national narrative over the past eight months than that he must be traded now, for whatever the Phillies can get. And when GM Ruben Amaro held out for a would-be superstar, demanding Corey Seager from L.A. or Nomar Mazara from Texas, he was called stupid and stubborn in so many ways that you’d be forgiven for believing that he was literally a donkey, or worse, a teenager. What that narrative misses is that if you’re asking for a king’s ransom in a trade, it doesn’t matter how many times you hear “no” as long as you hear “yes” once. And Amaro finally got full value from the Rangers — not in the form of Mazara, but in depth of prospects. He wanted to trade a dollar bill for another dollar bill, but in Nick Williams, Jorge Alfaro, Jake Thompson, Alec Asher, Jerad Eickhoff, and Matt Harrison, he got three quarters, two dimes, and a nickel. It wasn’t what he wanted, but he made absolutely sure that what he wanted wasn’t actually attainable before he settled for something close. This will almost certainly be the biggest deal of this deadline season, because even if David Price is a better player, Hamels is locked up through 2019,1 and Price is only locked up through the World Series. It’s an earthshaking move for two franchises, and for baseball at large. It was the biggest story of the night. It also closes the book on the Phillies’ incredible 2007-2011 run for good, since Hamels was the last member of those teams who was still on the Phillies and still performing up to the standard he set at that time. Hamels was one of the first pieces of that team to arrive, and the last to leave, marking 12 years with the franchise. The Phillies drafted Hamels when I was a freshman in high school, growing up across the river in South Jersey, and the landmarks in his career — any career that long, really — wound up echoing landmarks in the lives of thousands of fans, like me, who grew up as people while he grew up as a ballplayer. I remember the 2002 draft, the time he broke his hand in a bar fight, and picking up my phone in April 2007 to find my best friend from home on the other line, raving about how Hamels had struck out 15 Reds. There weren’t many other Phillies fans where I went to college, so I was on the phone with the same friend that October, when Hamels started the Phillies’ first playoff game since Joe Carter’s walk-off in 1993. There were more phone calls the next October, when Hamels was named MVP of the NLCS and World Series, and after we graduated from college, we defended Hamels, who had a year of BABIP Hell in 2009, on our tiny Phillies blog. And so on as Hamels added a curveball and cutter and turned into a monster, shutting out the Reds to clinch the 2010 NLDS, then tossing six shutout innings to win Game 3 of the next year’s NLDS in St. Louis — the last playoff game the Phillies won, or likely will win for some time to come. In recent years, as I’ve taken on a national focus for Grantland, I’ve stopped being the kid who calls people five states away to shout about Hamels going for double-digit strikeouts. Some of that’s intentional, some not, but it’s part of growing up, as a writer and a person. Almost every national writer, no matter how universal his or her scope, or how coldly rational his or her analysis, started out as a kid who’d call long distance to talk about a favorite pitcher’s double-digit strikeout game with someone else who’d understand, and if you don’t believe that, go back and read Jonah Keri on Pedro Martinez. I genuinely didn’t think Hamels would get traded by Friday’s deadline, and looking back on it, I wonder how much of that was colored by the past 12 years — that it was just that tough to imagine Hamels playing anywhere else, and what that meant for the loud, naïve undergrad who watched Hamels pitch so many important games the better part of a decade ago. Anyway, that’s why we shouldn’t mock Wilmer Flores for crying on the field last night. Because on some level, I get it, and so do you. Barring injury or a severe drop-off, Hamels’s $20 million team option for 2019 seems like a guaranteed pickup.